I'm not sure if you know it or not, but Mardi Gras season has just begun in New Orleans and certain parts of southern Alabama, Mississippi, Texas and the western Florida panhandle. Parties, parades, masquerade balls and barbecues mark the most festive season in America. The season begins after Twelfth Night (January 6) and ends on Mardi Gras (Fat Tuesday, in French), the day before Ash Wednesday. Forty days later, it's Easter. Every week from now until then, I'm going to try to post an authentic New Orleans recipe in celebration. I'm starting with a drink because... well, it's the first thing I get when I go to a party. 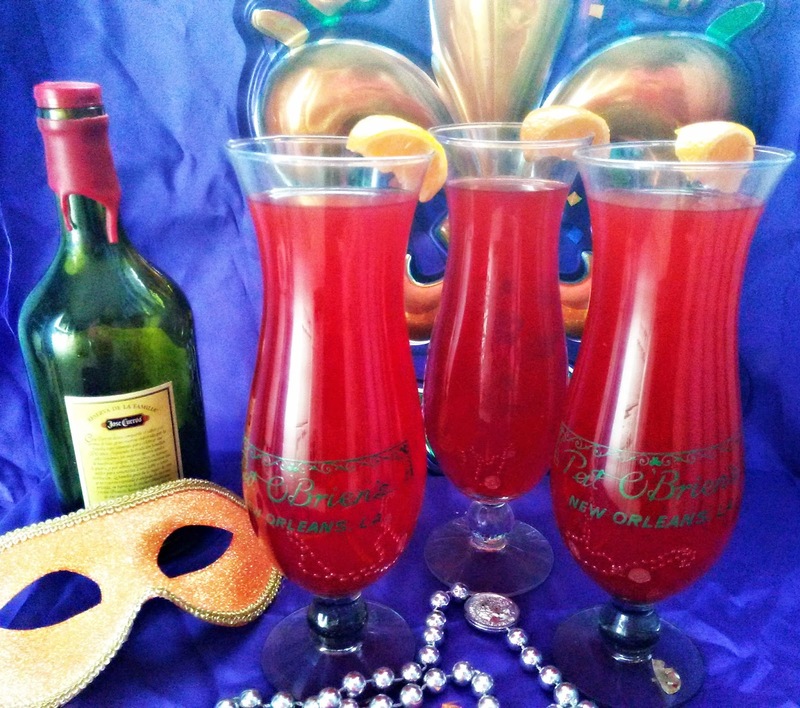 I'm a grandchild of New Orleans and every Mardi Gras season, my family travels to NOLA to enjoy time together, party and drink our share of a New Orleans original: The Hurricane Cocktail. A little history: the drink was created because there was a surplus of rum at Pat O'Brien's, a bar in the French Quarter. To get rid of it and drive sales, the drink was served in a hurricane lamp and the rest is history. The hurricane glasses in the picture above came from the bar and are housed in my grandma's china cabinet alongside dozens of others from area hotel bars. Our whole family has been collecting them for years (through legal tender, of course) and in 2012 I added my own to the family collection. The drink itself is VERY sweet and VERY potent. I always leave the simple syrup out when I make mine, but you can add it, use superfine sugar or omit it like me. It's still very sweet without it. I went to New Orleans once for Mardi Gras and kinda got plastered with these hurricanes! haha :-D It was fun! One of these days I'd love to go down there for Mardi Gras - it sounds like a blast. And I need to try a Hurricane! What I wouldnt' do for one of these right now! I need to get myself to Mardi Gras one of these years! Love this. You have to love a celebration that lasts that long! 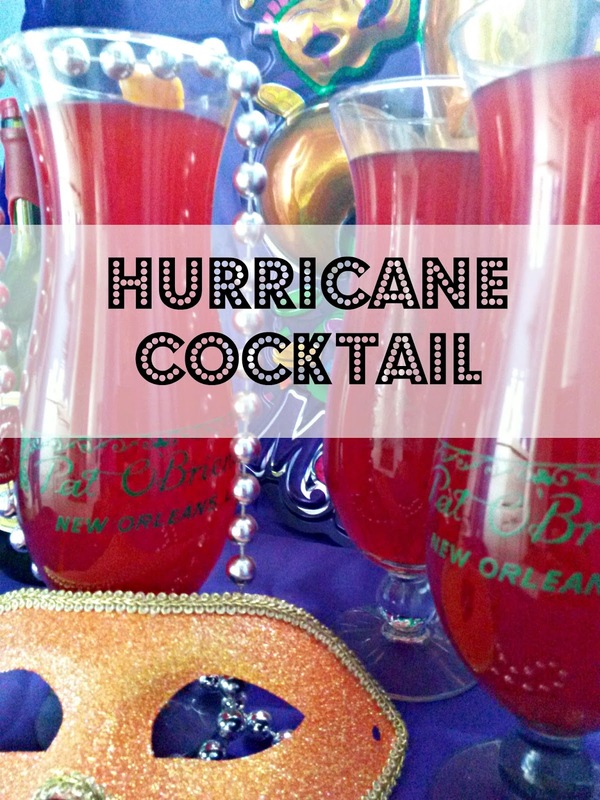 There's nothing better than a Hurricane on Mardi Gras. Going to Mardi Gras is on my to do list. Now I'm adding this hurricane, with the simple syrup!I loves me a little sweet. One of my friends met her husband during a visit to New Orleans for Mardi Gras - and I remember her telling me that they were all drinking Hurricanes! Can't help but think of my friend when I read your yummy recipe! Now I want a cocktail before bed...haha.